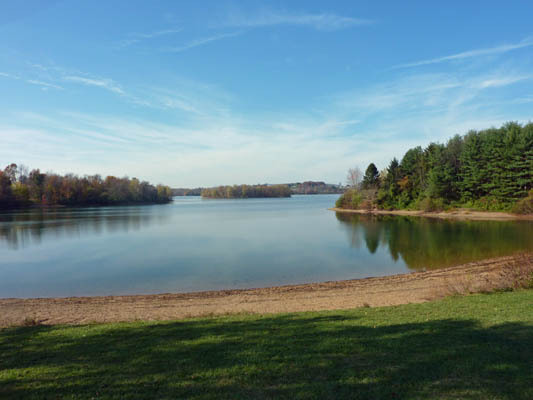 Codorus is a 3452-acre state park located in York County, Pennsylvania off of Route 116, south of Hanover. 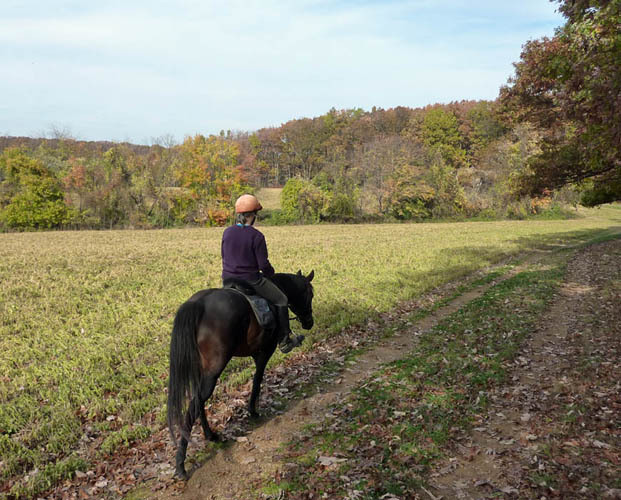 It is a great place to visit for trail riders living in the north central Maryland or southern Pennsylvania. 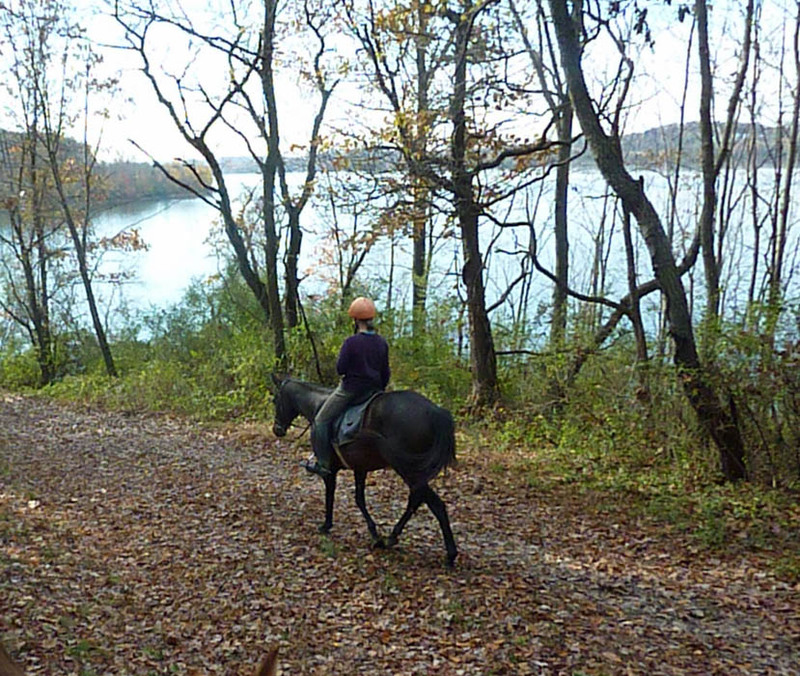 It features over 9 miles of equestrian trails with many scenic vistas of beautiful Lake Marburg. 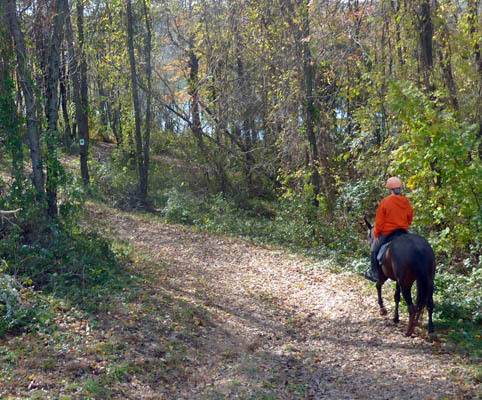 It is very well maintained with wide open trails in various settings. 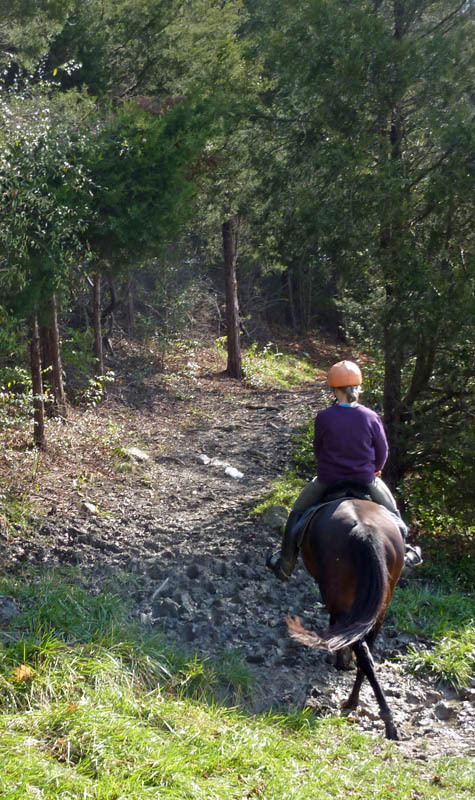 Only a few sections are somewhat hard, rocky or washed out, but the vast majority of the trails have footing that is easy on horses' feet. There are also a few spots were small washes cross the trail and the areas can be muddy in wet weather. Lastly, there are stretches of the trail that are along the shoulder of roads and a few road crossings. 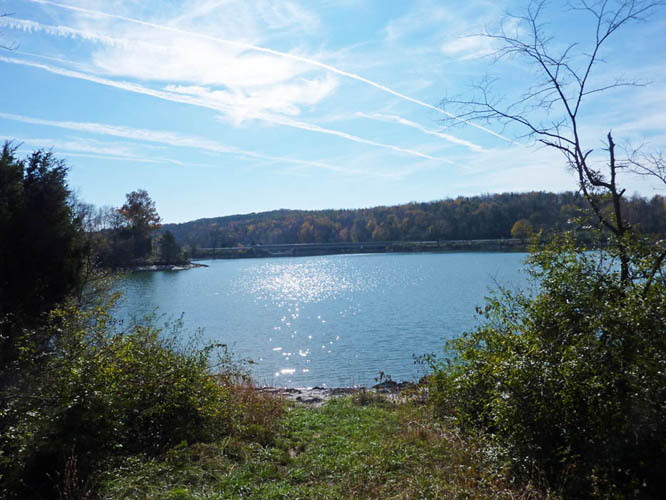 Codorus State Park is not hard to find. If you are heading north on Pennsylvania Route 116 you would make a right on Sinsheim Road and if headed south, make a left. Once on Sinsheim Road you go only a short distance and make a left onto access road leads in the trailer parking area and boat launch areas. It is marked with a sign. The parking area is large and can accommodate about 40 trailers of all sizes. 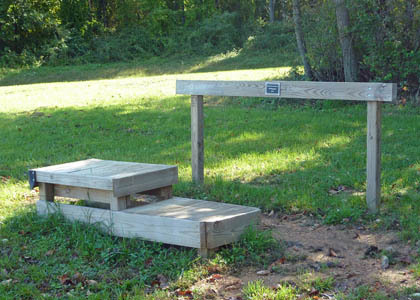 There is a crushed stone turn around but the parking itself is on grass.There is a mounting block, picnic tables and a Port-A-John located in the parking area, which is maintained from contributions made by members of the Pennsylvania Rangers, a volunteer equestrian organization that is active at the park. 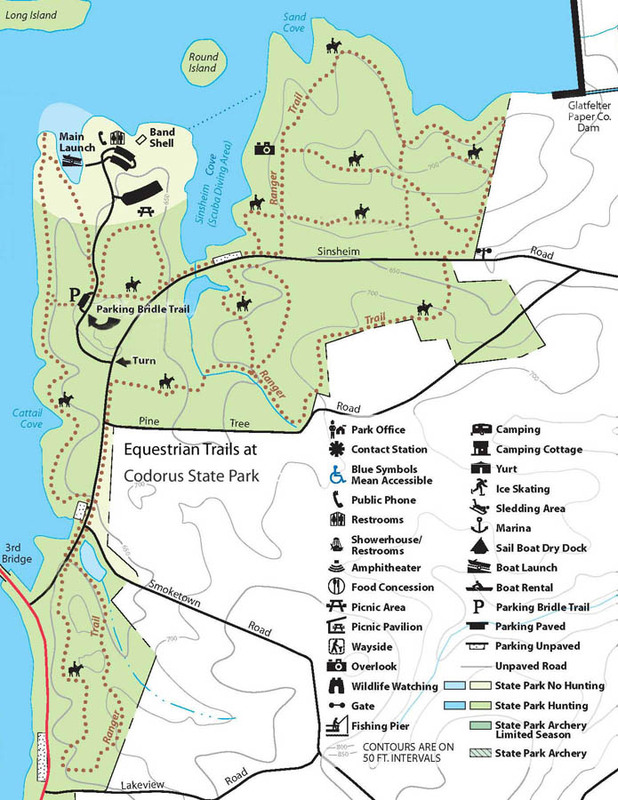 If you are a first time equestrian visitor, I now will take you on a virtual tour of the trails. Once you off-load at the parking area you will discover that there are three different trails leading way from the parking area. One of the trails heads north and we will be coming back on that one during Leg One of our tour. Another one crosses the access road and heads east along side of a woods. We will come back that way. The third one heads west toward the lake and down hill and that is the one we will start with. 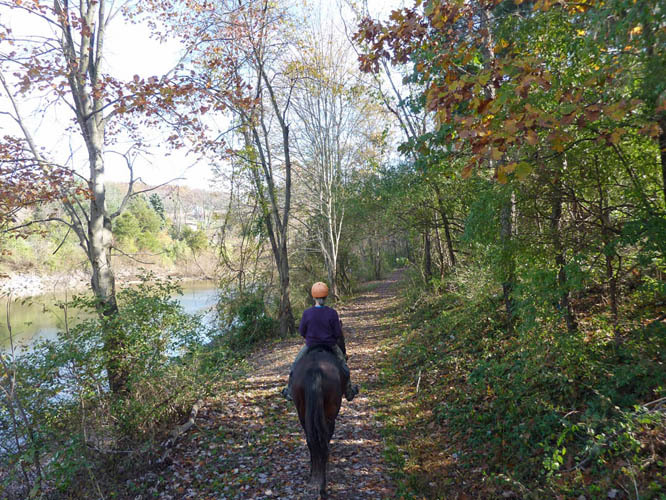 There is no right way to see Codorus and different riders follow different routes. I am using a path we often take for the purpose of our virtual tour. At times we decide to use other routes for a little variety. Well, let's go. You might wish to use the nice mounting block that the Pennsylvania Rangers built next to the parking area. 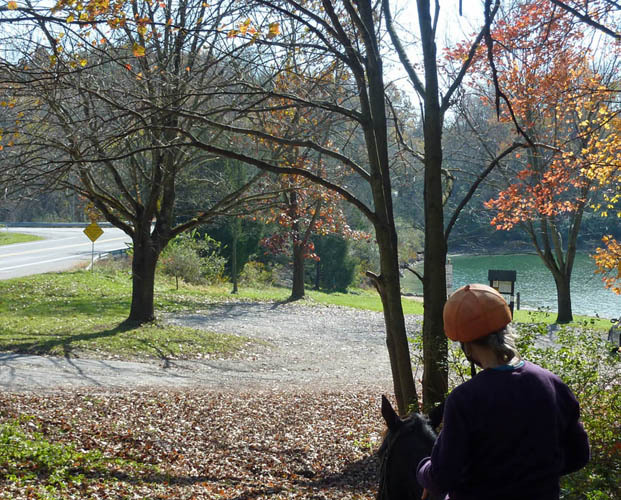 If you do ride away from the mounting block (see photo above) and turn around facing the other direction and go down the hill toward the lake (see photo below). The trail curves to the right and then goes down a steeper and somewhat washed out path to a trail what runs along the lake side. We bear right (see photo below) and go up a straight away headed northeast. You can see the lake over your left shoulder and the boat slip area on the other side. Watch out for the occasional ground hog hole that shows up along here. Our last couple rides there has not been any. We are making what is a small loop just for a warm up. If you follow this trail to the end you will then dead end on the lake and a nice vista (see photo below). Once you have had enough of that turn around and retrace your steps a short distance to the point there is a branch to the left and go up that trail. 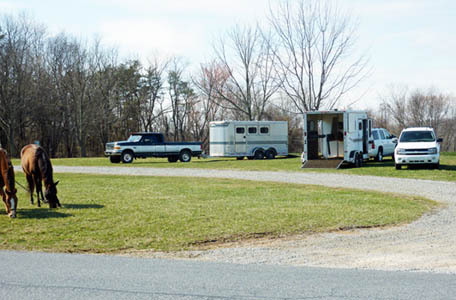 It brings you out in a field with the trailer parking area visible in the distance (see photo below). Its a good spot to canter back to the parking area. Once there we ride around to our starting point and what we have done is completed a big loop in this first leg of the ride. We are back where we started from and once again head toward the lake and down the hill and this time turn along the same lake side trail but turning left and going in the opposite direction from our first leg along the lake (see photo below). This trail has its turns and twists and there is a small trail that we will ignore that intersects from the left. In the end we come to a twist that ends up next to Sinsheim road and another crushed stone parking area that is used by fishermen (see photo below). 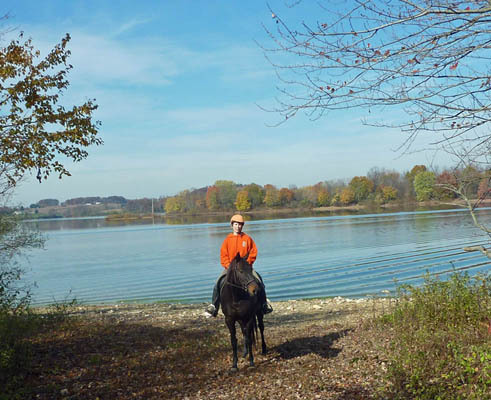 When we first rode at Codorus we did not realize that there are more trails beyond this point but trust me there are. 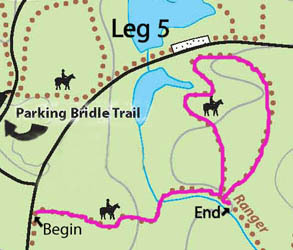 Continue riding, crossing the entrance to the parking lot and heading at an angle away from the road and toward the lake slightly downhill. There is a recently cut drainage channel to your left. Unfortunately, the ground is usually swampy here except during the driest part of the year. You will notice a narrow path what runs between the road and the lake at a level maybe six feet below the level of the road (see photo below). Before this was cut it was necessary to ride on the shoulder of the road here. After a short distance down this path we ride up the bank and to a crossing point over Sinsheim Road. This is marked as a horse crossing and there is moderate traffic on Sinsheim Road. The traffic coming from your left is around a corner but you can usually hear something coming even if you cannot see them at first. The traffic coming from your right is easy to see. There are also rumble strips in the road area to keep sleepy motorists from running the stop sign at Route 116 and ending up in Lake Marburg. Horses might be startled when they first hear this sound. We cross Sinsheim road watching out for traffic and now see that there are two ways that we might go. If we turn right there is a trail going up a hill but I would rather go down a hill so I will turn left and go down a small bank to a trail that runs long the bank of a small pond that you will sometimes encounter people fishing in (see photo above). In dry weather it is sometimes almost dried up. Your follow the path down a small valley in the woods and towards the end of this path it gets very swampy. You finally come to the end of the woods and also the boundary of the park and curve left and go up a hill. 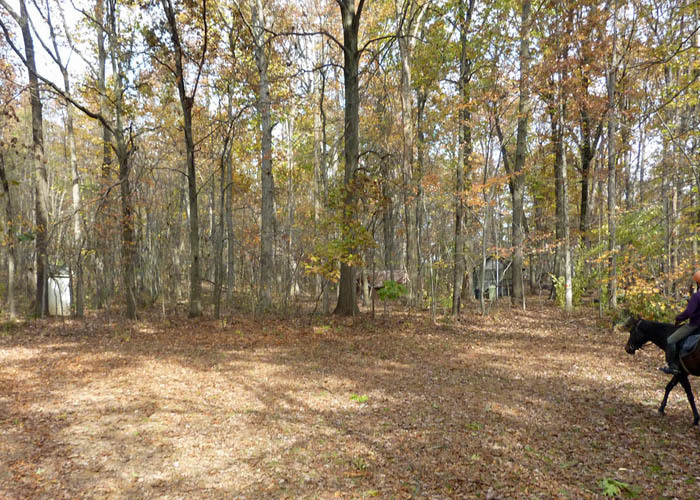 Once you are at the top you see a large home through an open area in the tree line to the left and a utility cut to your right. We just go straight ahead and down the hill. At the bottom we turn sharp right and we are going up the hill again on a broad but winding, grassy path in the woods. Once at the top there is a somewhat steep drop back to the point we started and we have now completed basically what is one big loop. During the winter when the foliage is off the trees you can look down on the Route 116 highway bridge crossing Lake Marburg from the last part of the trail along the hillside. You might also choose to follow the loop the other way or double back on yourself and do the trail both ways for a little longer ride. We have now finished the third leg of the tour. Once at the bottom of the hill we turn right and ride along the shoulder of the road between the roadway and a guard rail. 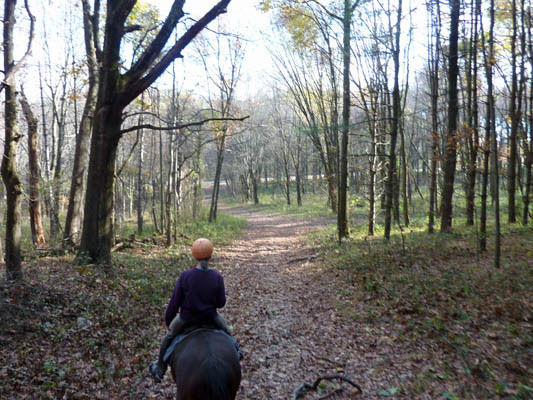 If you are uncertain of how your horse might act with traffic passing so closely you might recross the road and work out another route to avoid this stretch. For example, you can retrace the route on Leg 2 and walk out the entrance road and recross Sinsheim Road at a point, which is a longer route but brings you out at the same point as my route going along the shoulder of the road. 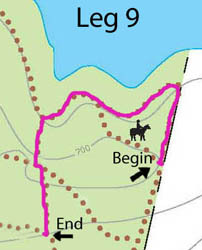 There is also a short-cut trail along the lake that runs between a point halfway along the route of Leg 2 and joins the entrance drive, but I do not want to make this too complicated. 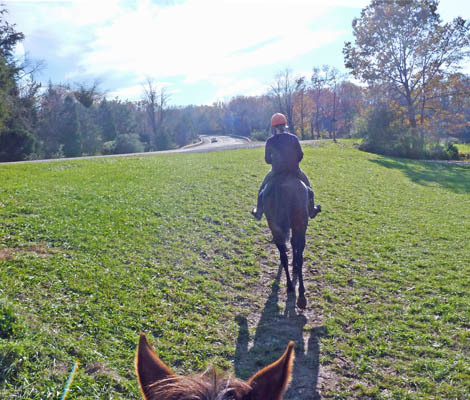 Our horses are accustomed to traffic noise and an entire motorcycle "gang" can pass and they do not bat an eye. You may not be so lucky. They look like a fairly tough bunch so I suggest that you do not make any rude gestures as they pass by, but I know you are not that kind of person. Seriously, for the most part, motorcyclists are among the most courteous people on the road. They understand vulnerability much better than other motorists and usually try to coast by a rider as quietly as they can without gunning their engines. You need to pass over two roads that intersect with Sinsheim and also pass by a couple of storm drains that my horse nervously eyed them first time we walked along here. Some of our friends dismount and lead along the road. Do what you need to do to be safe. We always wear orange or other high visibility colors so motorist notice that we are alongside the road. Once you are almost to the turn going into the parking area we go down a dip and then up a bank and the trail reenters the woods and we finally get away from the roadway. It is nice to be back in the woods and away from the roadway. 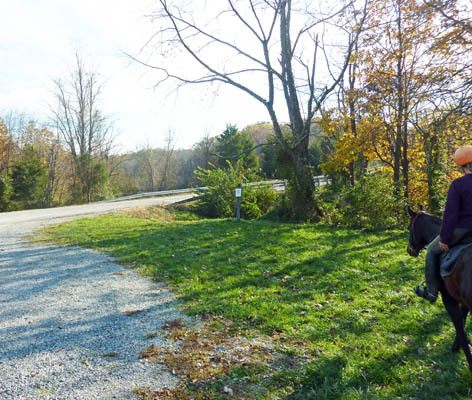 We are headed up a short path parallel to the road that intersects with a wider one that is opposite the drive leading to the horse trailer parking area. Some people wanting a shorter ride will ride out the access road, cross Sinsheim Road and enter the woods at this point. If you need to return for some reason we are close to the parking area at this point of the ride and you can ride back to the parking area from here as well. We turn right and after a flat stretch ride down a slope. There is another pond off on the left and at the bottom we turn right and there is a straight path along a small stream that runs into the pond. At the end of this stretch we turn left and cross over a series of two culverts through which small streams pass. You may or may not notice that there is a small cut that continues straight at the curve also but it only leads to Pine Tree Road and is one that some local riders use to get into the park trails. Do not wast your time going that way. The main trail continues up a hill along a sunken trail that is somewhat washed out but not too badly. At the top of the hill in what is still an oak woods there is a loop that opens up on the trail. We will pass slightly to the left to continue riding and taking this loop. The trail crosses a drainage ditch, which is always dry unless you are riding in a downpour and pass by a lake. You pass over another culvert and go up a steep hill and at the top turn right. 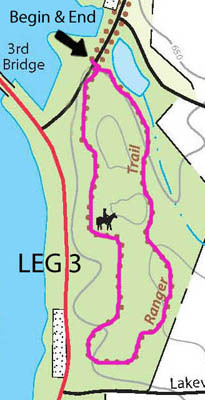 The trail also continues straight but this is intended for hikers and not riders. We ride around the rest of the loop and in one area where the grass is higher you need to watch out for ground hog holes. These last couple years they have not been as active for some reason but in the past there was always at least one big bad hole along this part of the trail. Once we have finished the loop we reenter the mail trail at a point which is only slight further up from the point we entered and we have now completed the fifth leg. Once we finish riding around this loop we turn left and back on the main trail. The trail continues first just slightly uphill and then you descend until you turn left just before hitting Pine Tree Road (see photo below). We ride down a trail and bend around left at someone's little camping area where there are a couple small buildings or you might even say shacks if you are not a realtor by profession (see photo below). You go up a wide trial that puts you out in a field that has a long vista of the surrounding countryside. Turning to the right we walk along a field with an oak forest to our right (see photo below) and then turn left to continue around the next side of the field. The trail turns right again into the woods and we can see traffic on Sinsheim Road down the hill. The trail continues with a packed clay and stone surface of what might have been an old farm road straight through the woods and ends at private property and someone's lawn. There it turns left and after a short distance this stretch meets Sinsheim Road. Crossing here is no problem as you can see the oncoming traffic clearly in both directions. We have now finished Leg Six. 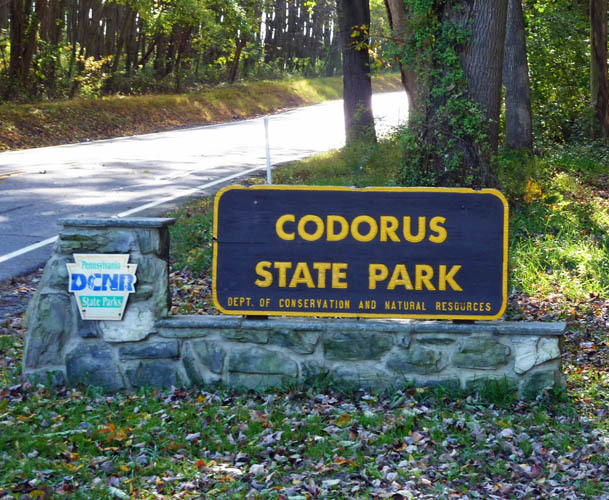 When we cross Sinsheim Road there is a large Codorus sign to our right (see photo above). 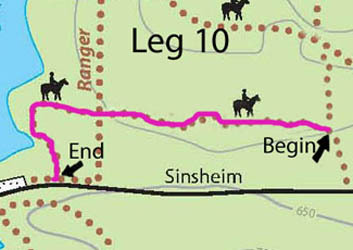 There is a narrow trail that comes off to our left and heads south-west parallel to Sinsheim Road but we will ignore that one. Instead we walk straight and curve right. This area is often a little swampy but only for a short distance. We meet up with another trail and turn left onto it. This is often called "the White Trail" since it was marked with white blazes on trees along it. It bisects the various trails on this side of the park. It runs on an uphill grade and once we are about halfway up it we encounter a washed out area that is full of stones. Have mercy on the horses and walk slowly here. There are two other trails that intersect at this point. We will ride on them later in the ride. The first intersects from the left and the second a short way up intersects from the right. Just keep going straight and the trail becomes flatter. We might do a canter along here as the trail is no longer rocky. At the end of this trail we encounter the main trail that runs along the lake front. We have just ended the seventh leg of the ride. 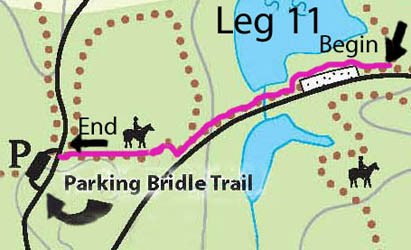 We have encountered the main trail that runs along the lake and turn right and ride for a long distance along it (see photo above). There are a couple uphill and downhill grades and one swampy place. For much of the trail you do not get a good look at the lake, which is hidden by trees. However, at a couple points there are some nice vistas of the lake. You also get glimpses of the Glatfelter Paper Company Dam that serves to create Lake Marburg. The lake is shaped like a big letter "T" and we are just seeing the right side of the cross bar of the letter. The entire park is big enough that they have a separate series of trails for mountain bikes and another for hikers. 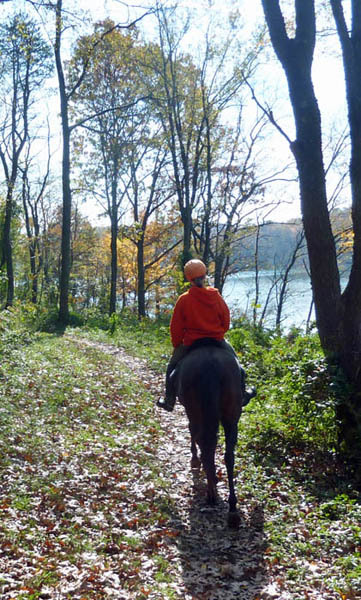 We may run into the odd person walking along these trails but mostly you meet other horsemen. As we are going along we pass the entrance to "the Blue Trail" branching off on a slight uphill grade to our right. We will ignore that for now. We go farther and there is another branch coming off to our right. I plan to turn onto it but this one is easy to miss. It is just over the crest of a slight hill and turns into the woods. If we do miss it, it's no big deal. We are just using it to make a loop and turn around and come the other way on the main lake front trail. It is possible to catch it coming around the opposite way if we do miss the turn. Anyhow, we turn right onto this trail. The trail surface here is not hard and it makes for a nice canter first downhill and then uphill to the end of this particular trail. It dead ends into a trail that runs along the border of the park with a young pine forest owned by the Glatfelter Paper Company. Slow down before you reach the end. There may be riders coming up that trail. We have just ended the eighth leg of the ride. We have dead ended on a trail that runs along the eastern border of the park with a pine forest owned by the Glatfelter Paper Company. We will turn to the left. If we had turned right we would find that the trail leads down the hill and intersects with the far end of the "White Trail" that I mentioned in Leg Seven near that crossing point over Sinsheim Road. However, I am not taking you over that trail today and you might explore it another day. Instead we turn right and go north toward the lake. At the end of this stretch the trail bends left and continues downhill and along the lake (see photo below). You go uphill and downhill and make a couple bends and at last you come to the entrance of the "Blue Trail" that we passed earlier. This time we will turn left and into it. This trail connects the lake front trail and the "the White Trail." It goes uphill and is just a little rocky in places. When we reach the end we are once again in that washed out and very rocky part of the "White Trail." We turn left here and go down the trail in the opposite direction from which we went on Leg Seven. When we have gone only a short distance there is a branch and we take the trail that goes right. This is a farm access lane that leads to a field located to our right that is right in the middle of the park. The surface is clay but there are some washed out ruts along here so watch where your horse's feet are going. If you look ahead you see the lane leads to Sinsheim Road. About half-way along this lane there is a trail that heads off into the pine forest and we will turn right and into it. 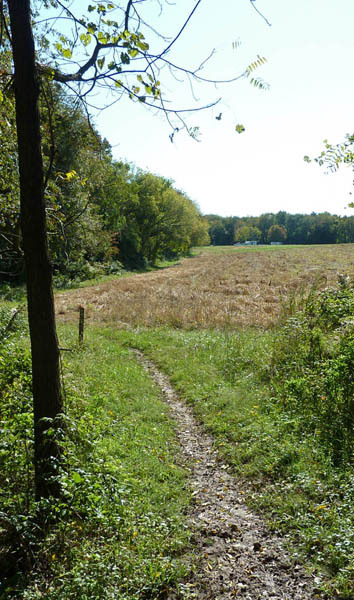 If we had continued down and to the end of the lane and then turned into a narrow trail to the left, this leads back to the crossing point on Sinsheim Road near the large Codorus sign. 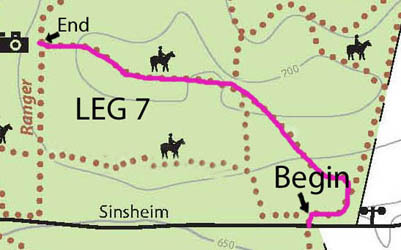 We passed that by on Leg Seven as well. Leg Nine ends at the opening to the trail in the pines. My horse is picking up his pace. We knows that we are now headed home. 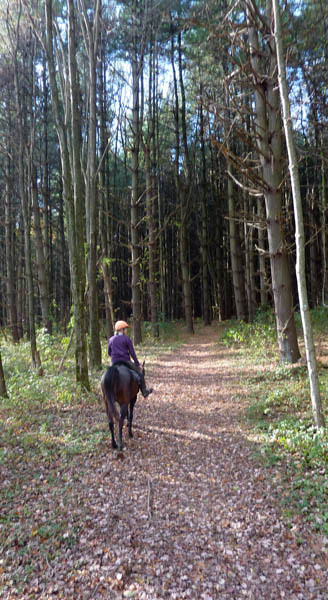 The pines are very nice to ride in (see photo to the right). In the summer it is cool and shaded in here and they dampen any traffic noise coming from Sinsheim Road, which is down the hill but hidden by trees. The pine needles are easy on the horses feet. 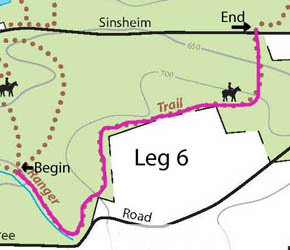 This trail was built a couple years ago on the instigation of the Pennsylvania Rangers and does not appear on the official map but I have added it. My wife always says that it reminds her of the Black Forest in Germany and she is right. 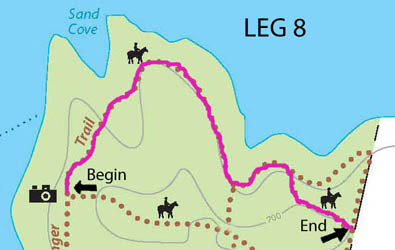 After we have been on it for most of its length we intersect with the the Lake Side Trail. Rather than turn here I am continuing straight along a short trail that heads towards the lake with pines on either side. Once we reach the end of it we curves around and head down another rather narrow lane between the pine trees. This turns off to the right and goes down a bank and finally intersects with the Lake Side Trail. There is one short swampy area along it. We turn right on the main Lake Side Trail. The tenth leg of our tour ends here. We are now heading back to the trailer by the shortest route. 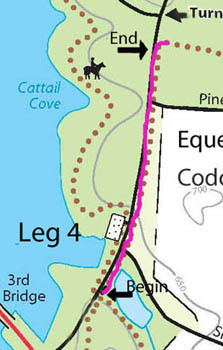 We pass down a short stretch of the Lake Side Trail and notice that the trail seems to end at a parking area on Scuba Diver's Cove (see photo below). 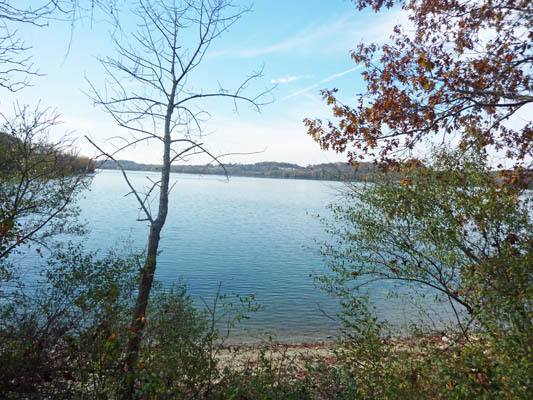 It's a nice view of Lake Marburg here (see photo below) and you can see Round Island in the distance. There are often people with dogs or people fishing here. A couple times we have watched search and rescue drivers practicing in this area, which is why they call it Scuba Diver's Cove. 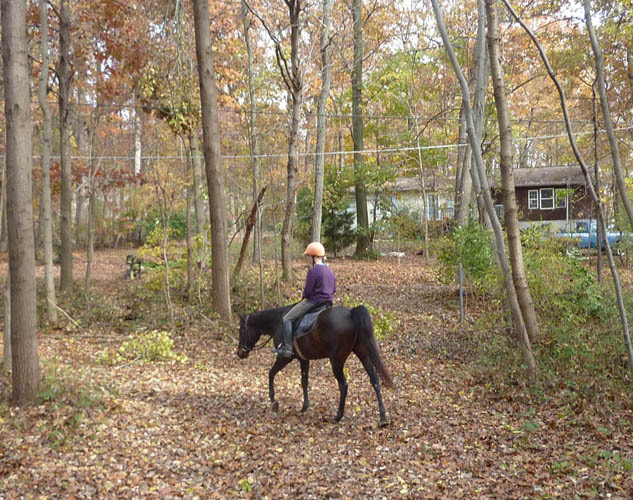 We walk our horse along a rather steep bank that leads to the water passing the parking lot to our left. When we reach the end we turn to the left and go a short distance toward the road where there is a narrow trail between the road and the lake (see photo below). This is similar to the one we used during Leg Two. We need to walk down a bank to get to it. This is another cut the Pennsylvania Rangers cleared out to avoid needing to walk on the shoulder of the road above us. At the end of it there is a short stretch that is parallel to the road but set back from it a little. We then reach an area which has crushed stone and leads up the bank and away from the road. We need to turn right and go up it but the horses do not like the surface very well. Once we get to the top there is a field. 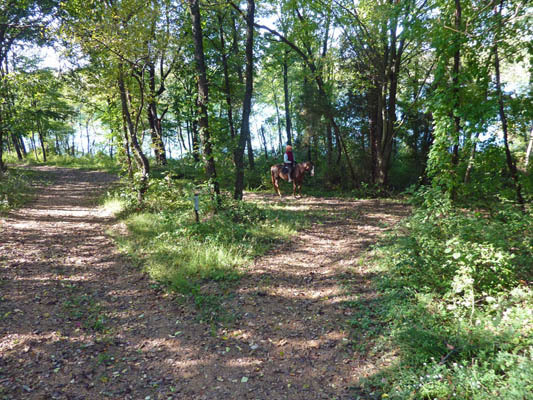 You can ride either way around this as the trail here is basically a big circle around the margins of the field that goes either way. I will turn left and follow the margins of the field back to the parking area. At the end of it we need to cross the access road and we are back to the parking area and have finished our ride. Leg 11: Approaching the parking lot at Scuba Diver's Cove. Our ride took about two and one-half hours give or take. I hope that you enjoyed it and it was great riding with you. I hope that you come back and visit Codorus again. Next time bring your horse and leave the old computer at home.